We’d love your help. Let us know what’s wrong with this preview of Among the Goddesses by Annie Finch. 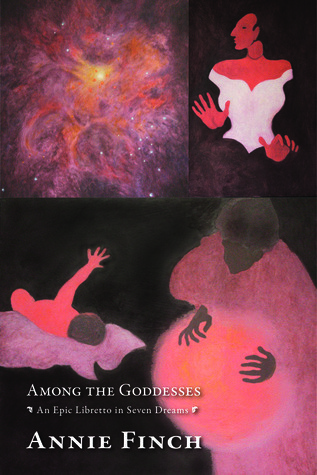 To ask other readers questions about Among the Goddesses, please sign up. Annie Finch is an award-winning poet and writer on earth-based spirituality. Her incantational, mystical, exquisitely-crafted poems are known for their virtuosic use of form to “cast a spell” on the reader. Her books of poetry include Spells, Calendars, Eve, Goddess Poems, The Poetry Witch Little Book of Spells, and a ritual drama about sacred abortion, Among the Goddesses: An Epic Libretto in Sev Annie Finch is an award-winning poet and writer on earth-based spirituality. Her incantational, mystical, exquisitely-crafted poems are known for their virtuosic use of form to “cast a spell” on the reader. Her books of poetry include Spells, Calendars, Eve, Goddess Poems, The Poetry Witch Little Book of Spells, and a ritual drama about sacred abortion, Among the Goddesses: An Epic Libretto in Seven Dreams. Her poetic collaborations with theater and music have been performed at venues including Carnegie Hall, American Opera Projects, and the Metropolitan Museum of Art. Annie has also published many books that unravel the mysteries of poetry for poets and poetry-lovers, including A Poet’s Craft (University of Michigan Press), The Body of Poetry: Essays on Women, Form, and the Poetic Self (University of Michigan Press Poets on Poetry Series) and the anthologies Measure for Measure: An Anthology of Poetic Meters and Villanelles (both from Random House/Everymans Library). To share the wisdom she has learned on the path of the poet with spiritual seekers from all backgrounds, Annie created Five Directions Workshops, a path of psychological and personal growth through rhythmical writing, community, art, and ritual. When not traveling to perform her poetry, Annie divides her time between Washington D.C. and a cabin in Maine with no electricity.